As promised, the well-connected developers of the controversial Domino site on the Williamsburg waterfront opened the gates to the old sugar refinery yesterday for a community celebration of spring and, we guess, the pending $1.2 billion megaproject. 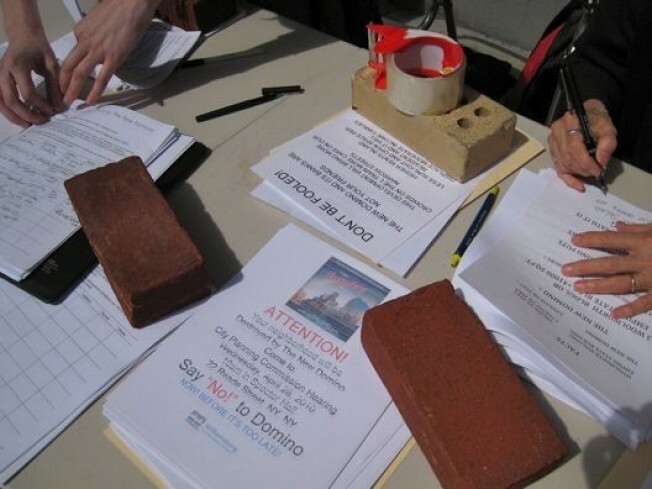 The folks lured by neighborhood rumors that CPC Resources would have applications on hand for affordable-housing apartments within the project's first phase had to instead make due with popcorn and cotton candy, and some anti-Domino handouts from project opponents near the South 3rd Street entrance. Rising high over the river, the landmarked 1882 refinery building shows row upon row of open windows and cries out for some TLC. Word on the waterfront is that some enterprising recyclers have stripped out the copper flashing, which seals the insides from the elements, further endangering the old block of bricks. What's planned for the site is a design by architect Rafael Viñoly incorporating the refinery and its massive smokestack into a multi-tower mixed-use development of over 2.8 million square feet and 2,200 residential units. The development is opposed by many locals who say the project is too dense for the neighborhood and its overburdened subway and city services. The whole rezoning enchilada will be further discussed at a City Planning Hearing on April 28.